With the special support and care of the Ministry of Culture and Minister, Mirela Kumbaro Furxhi. 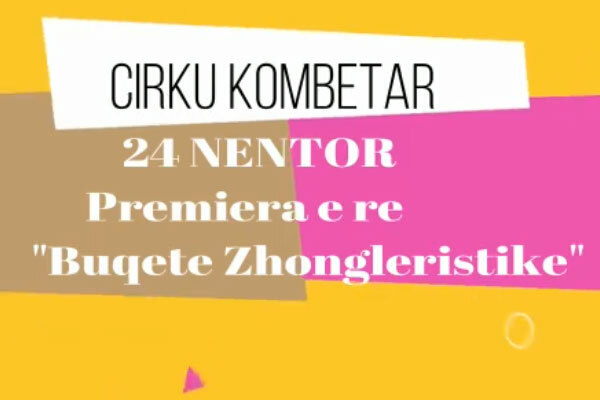 National Circus on 28-29 November welcomes you at the premiere of the "Zhonglerist Bouquet"
Idea; Loreta Kryeziu & Gentian Dollaku, Director; Alketa Haxhiu, Scenography; Klajd Ymeri, Photo & Video; Sara Cengu. With the participation of the acting acrobats Loreta Kryeziu, Gentian Dollaku, Eris Dakli Hoxha, Irida Dorri, Ibrahim Selishta, Sabina Troshku, Loredana Dushku, Ali Tufa, National Circus Studio under the guidance of Silvana Dumi & Agron Muho Masters and with a special participation of Veteran Master Mr. Sokrat Buzo, also in memory and respect of the work of the late Master Halil Minxolli.